IT CERTAINLY made the 250-mile round trip worthwhile. Southend’s rising snooker star Richard Hillgrove has collected his first winner’s trophy on the Cuestars Under-21 Silver Tour and taken over top spot in the rankings. 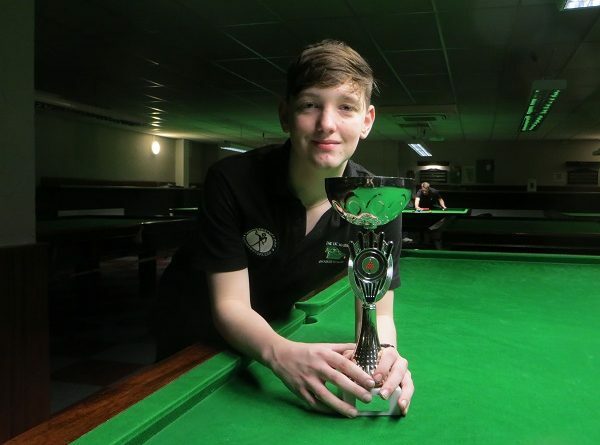 The 15-year-old was forced to battle hard all day in the fifth leg at Chandlers Ford Snooker Club, near Southampton. And it was no different in the final as Hillgrove overcame Mason Wilson 2-1 from 1-0 down. Hillgrove also paid tribute to his ten-year-old semi-final opponent O’Shay Scott (Eastleigh). Hillgrove, who is based at Basildon Snooker Club, had beaten rankings leader Riley Ellis (north Wilts) 2-1 in the last-eight, a reversal of the scoreline when the pair met in the final of the fourth leg in Coulsdon, South London. And the Essex teenager was so excited and overwhelmed by the occasion that he had to be called back from the club car park to collect his cue and case. Wilson (Basingstoke) reached his first final since gaining promotion from the Bronze Tour by beating leg-three winner Samuel Laxton 2-1 in the last four. Portsmouth potter Laxton had dispatched former rankings leader Louie Leighton (Basildon) 2-0 in the previous round. Two players recorded new high breaks. Dean Russell (Portsmouth) compiled a 39 in his 2-1 group-stage defeat by Hillgrove and Wilson chalked up a 42 in his 2-0 quarter-final victory over Shane Kearns (Swindon). The race for the rankings title is shaping up to be the closest ever. Two points separate the top three and just 15 separate the top six going into the second half of the season. Third-placed Louie Leighton is one point behind Ellis. Kearns is ten points further back and three ahead of Scott and Laxton in joint fifth. The event was sponsored by Vortex Property Management to raise awareness of Sightsavers, an international charity that works in developing countries to treat and prevent avoidable blindness. For more information about the charity, visit www.sightsavers.org. The sixth of the ten legs is at Greenbaize Snooker Club, Bournemouth, on Sunday, February 3. ROUND-ROBIN GROUP A: 1st, Samuel Laxton (Waterlooville Sports Bar); 2nd, Riley Ellis (147 SC, Swindon); 3rd, Zak Truscott (Waterlooville Sports Bar); 4th, Keegan Reed (Salisbury SC); 5th, Kaine Petty (Salisbury SC). ROUND-ROBIN GROUP B: 1st, O’Shay Scott (Chandlers Ford SC); 2nd, Mason Wilson (Academy, Basingstoke); 3rd, Louie Leighton (Basildon SC); 4th, Oliver Cooper (Frames, Coulsdon); 5th, Harry Wilson (Waterlooville Sports Bar). ROUND-ROBIN GROUP C: 1st, Richard Hillgrove (Basildon SC); 2nd, Shane Kearns (Jesters, Swindon); 3rd, Callum White (Waterlooville Sports Bar); 4th, Nat Kidner (Greenbaize, Bournemouth); 5th, Dean Russell (Waterlooville Sports Bar). QUARTER-FINALS (12 points): Laxton 2-0 Leighton, M Wilson 2-0 Kearns, Scott 2-1 White, Hillgrove 2-1 Ellis. SEMI-FINALS (15 points): M Wilson 2-1 Laxton, Hillgrove 2-1 Scott. FINAL (25/18 points): Hillgrove 2-1 M Wilson.